You may remember the report entitled “A £4 Billion Hobby” followed by economic impact studies into the Goodwood Revival, the Beaulieu Autojumble and the London to Brighton run. This report marks the start of the next phase, reporting on the economic value of club events. The objective of these studies is to demonstrate to our legislators in both Westminster and Brussels the economic value of the historic vehicle movement and to strengthening our influence with them. 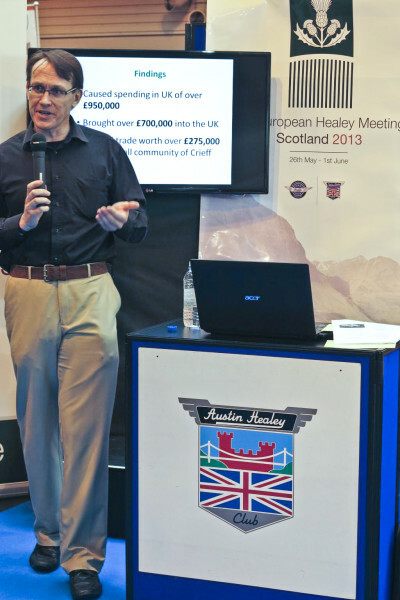 At our suggestion, the FBHVC chose our 4th European Healey Meeting in Crieff, Scotland for their first study into the economic benefit of club events. The event attracted 249 cars and crews from all over the world, 77 from the UK, 140 from Europe and 32 from USA, Australia, New Zealand etc. The research team from the University of Brighton attended the event to interview participants who were asked to fill in a questionnaire on their expenditure between leaving home and returning back again. 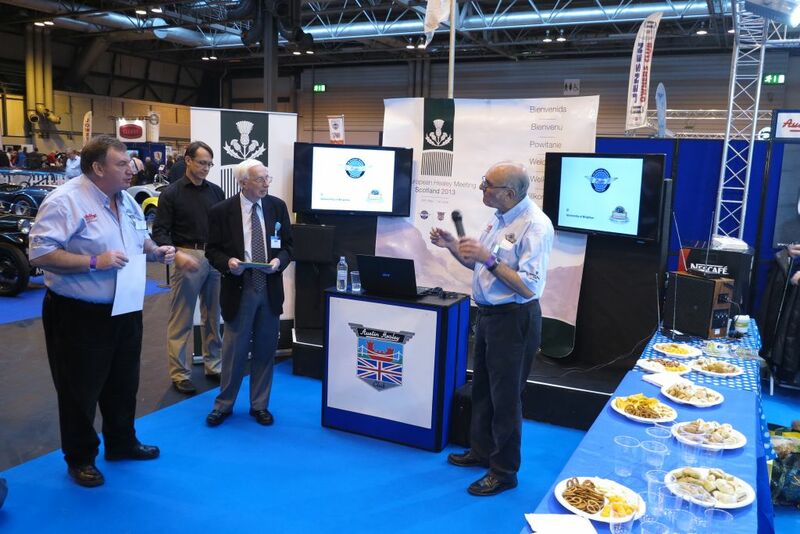 The presentation of the report took place on our stand at the NEC Classic Car Show to which members of the press had been invited. 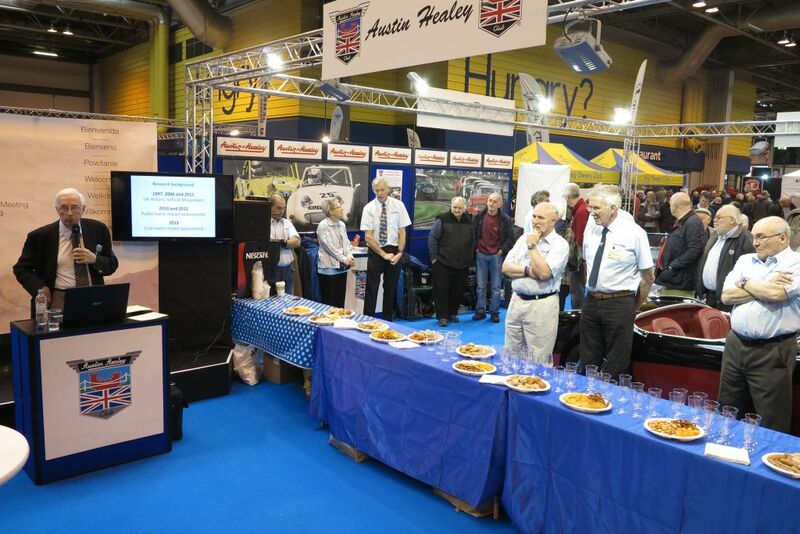 Peter Dodson had gone to great lengths to set up a very impressive club display stand for the occasion and we managed to attract a good sized audience. After introductions from our Chairman John Keener and Geoff Smith from the Federation, the report was presented by it’s author Jaime Kaminski from the University of Brighton. Caused spending in UK of over £950,000. Created trade worth over £275,000 (net) to the small Scottish community of Crieff. Encouraged tourism and other trade elsewhere in Scotland worth over £160,000 (net). Encouraged tourism and other trade in England and Wales worth some £360,000 (net). Contributed at least £150,000 to the Exchequer in VAT revenue. Generated over 7,600 person-nights of accommodation in hotels and guest houses. Author, Jaime Kaminski of Brighton University presenting the findings of the report.